Could scientists create dragons using CRISPR gene editing? 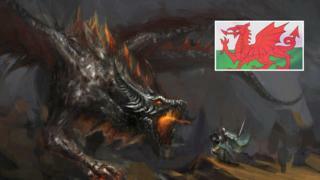 The mythical dragon has been associated with Wales for more than a millennium and famously graces the national flag. But is it possible dragons could ever exist beyond the pages of Celtic mythology or the celluloid of fantasy film? Academics have suggested in a recent essay the creation of large, winged dragons using cutting-edge genome editing is not beyond the realms of possibility. Is the seemingly far-fetched idea a flier or, like dragon's breath, just hot air? The BBC asked the authors. The essay in The American Journal of Bioethics said spectacular animals could be brought to life using a targeted gene-editing system known as CRISPR-CAS9. Co-authors Prof Hank T Greely, director of the Centre for Law and the Biosciences at Stanford Law School, and Prof R Alta Charo, Professor of Bioethics and Law at Wisconsin Law School, said their dragon suggestion was "somewhat tongue-in-cheek" but "not impossible". "There are the possibilities of spectacles," they wrote. "Animals and plants not created for personal use but to be exhibited. "Consider, for example, the dragon. Basic physics will almost certainly combine with biological constraints to prevent the creation of flying or fire-breathing dragons. "But a very large reptile that looks at least somewhat like the European or Asian dragon (perhaps with flappable if not flyable wings) could be someone's target of opportunity." And it may not be as improbable as it seems at first blush. CRISPR and other similar techniques involve DNA being inserted, replaced, or removed from a genome using artificially engineered nucleases. The method has been adopted by scientists around the world. CRISPRs (clustered regularly interspaced short palindromic repeats) are sections of DNA, while CAS-9 (CRISPR-associated protein 9) is an enzyme. They are found in bacteria, which use them to disable attacks from viruses. They have led to the creation of patented "GloFish" that shine under UV light, the eradication of horns from certain cattle species, manipulation of crops and attempts to produce hypo-allergenic cats. Artist Eduardo Kac even commissioned a French geneticist to create Alba, a genetically modified "glowing" rabbit. Debate has raged over whether CRISPR, which occurs as part of a bacterial process, could be safely and ethically used on humans since 2012. But professors Greely and Charo argue its potential to produce "CRISPR critters" is "likely to be overlooked" by legislators and regulators "because they are unexpected". The method is "cheaper and easier" than older forms of genetic engineering and can be done "outside the traditional laboratory setting". Their essay looks at the possible uses of CRISPR for de-extinction of wild species - such as 700,000-year-old horses - for domestic de-extinction - such as tomato species - and for making creatures of "personal whim". They point out that Harvard geneticist George Church is using CRISPR to edit Asian elephant cell lines to give them some woolly mammoth genes. Asked about the likelihood of dragons, the co-authors said: "We imagine it would be low although not impossible with respect to appearance (the fire-breathing and flying aspects are undoubtedly beyond any plausible genetic engineering). "In the US, the determining factor is usually cost as compared to return-on-investment, where cost can be substantial given the regulatory hurdles. "Does this mean some determined and well-funded geneticist might do this as an artistic experiment, similar to the work done on the fluorescing rabbit? "Yes. But the operative word is 'might'." A potential process could involve modifications to an existing large reptile - for instance, a Komodo dragon. The professors said, even if scientists knew how to make them larger, there would likely be problems with the creature's mass increasing faster than its surface area or its bone cross-sections. The first issue could make the animals overheat; the second might mean the edited reptile's bones would be too weak to hold its weight. "If and when we actually come to understand in detail what every specific DNA sequence does and how they all fit together, though, all bets are off - things could move more quickly," they added. What does a CRISPR expert think? Dr Sam Sternberg - formerly of the University of California's Doudna Lab, which pioneered work with CRISPR-CAS9 - said his boundaries were stretched when Minnesota firm Recombinetics announced it had used a gene-editing technology to dehorn certain types of cattle. However, he is not hopeful genetic engineers could ever cross the Rubicon to create dragons. "You're talking about, not just one or a few changes, you're talking about massive changes and it gets to the point where, how much can you cut and paste the DNA that causes some of the traits of one species to another? "I would say it's probably bordering on impossible/never going to happen." Even if the difficulties connected with gene editing could be overcome, there remains the tricky task of assisted reproduction with an existing lizard species. Giving birth to any edited dragon would involve taking stem cells from, say, a Komodo dragon before inserting an altered nucleus into an egg for in vitro fertilization (IVF) in an adult komodo. That would be no mean feat; in December scientists carried out the first successful IVF on dogs after decades of trying. "If you got access to Komodo dragons and could quickly resolve the regulatory, stem cell, and assisted reproduction problems, you could start tinkering. "But it would likely take a very long time before you could hope to get something that looked much like a dragon," Prof Greely and Prof Charo said. So, how far off might all this be? Is the world ready for GM animals?